The traditional lecture style of talking at students for several hours lacks any interactive aspects, and can leave learners uninterested and uninspired. Lecturers at City wanted a way to engage students, encourage them to be at lectures and provide different ways to aid their studies. City already had a very basic prototype quiz app to trial in lectures, so our first task was to work with lecturers to maximise the app’s impact. 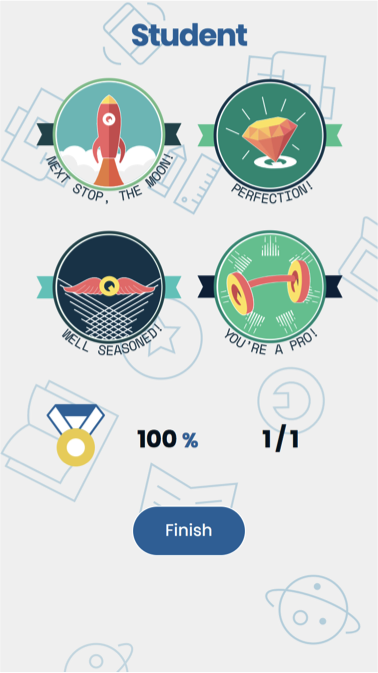 We gave special attention to the gamification of the app, for example, in order to further engage students - with animations, leaderboards and medals which can only be earned by attending lectures and paying attention to what is being discussed. We developed a mobile-first web app that allows students to take part in real-time quizzes during lectures, which can also be reviewed and used as revision study aids. Features include a super-simple quiz builder for lecturers, and revision functionality for students. Lecturers can project the app in lecture halls and watch answers arrive in real time as hundreds of students respond simultaneously. It is widely used across City University functionality for commercialisation has now been built in. The finished product was so intuitive and easy-to-use for lecturers and students alike, it was awarded runner-up by the Guardian Teaching Excellence Awards!